The Cheyenne and Arapaho Tribes is available here. 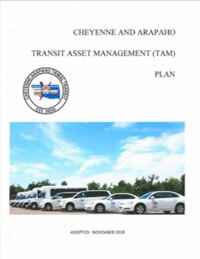 The Cheyenne and Arapaho Tribes established a Tribal Transit Program which began operations in 2010. The Cheyenne and Arapaho Tribal Transit Program (CATT) provides fixed-route and demand-response service within the Tribes' reservation boundary (service area), which consists of nine counties across 9,000 square miles in Western Oklahoma. Their TAM Plan aims to establish a systematic process for operating and maintaining their assets throughout their full life cycles, and to establish priorities and policies which will keep CATT operating at a full level of performance.